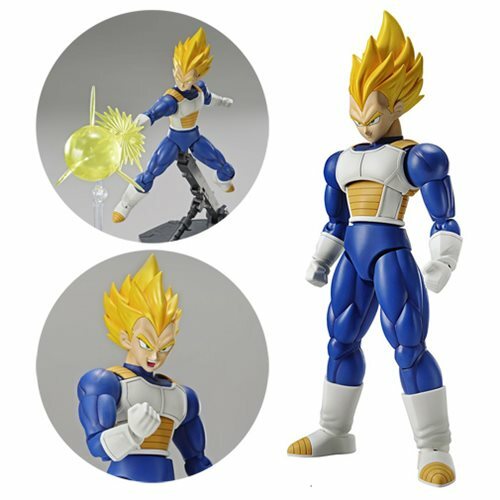 The most eagerly anticipated character - Super Saiyan Vegeta - is now in the Figure-rise Standard line-up! Build up the Dragon Ball Z Super Saiyan Vegeta Figure-rise Standard Model Kit muscles through the unique separation of model kit parts! Two special move effect parts are included along with two types of facial expressions. Pair this with Super Saiyan Trunks releasing the same month! (sold separately). Set includes 2 types of special move effect parts (Final Flash and Big Bang Attack) x1 each, 2 types of facial expression parts (normal and angry) x1 each, and 6 types of hand parts (left and right clenched hands, left and right Final Flash hands, and right Big Bang Attack hands) x1 each. 7x Runner. 1x Sticker. 1x Instruction manual. Item measures roughly 7-inches tall. Ages 15 and up.